The Women's Quilt04 Light Quilt Jacket from Ilse Jacobsen is a warm transitional jacket that can be worn equally well alone on a cold day or under a rain coat when they skies look a little more gloomy. 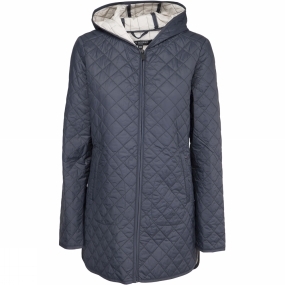 It features a beautiful diamond-quilted styling that is filled with synthetic insulation to help keep you warm in cold conditions, while the neat hood and cosy hand pockets can be utilised for extra heat retention should you need it. It has a long body length which is both fashionable and functional, and its lightweight, delicate finish ensures it looks ladylike and flattering, making it a pleasure to wear!